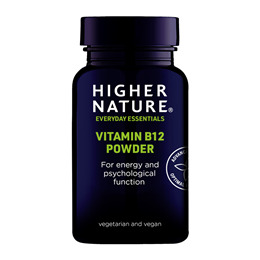 This supplement provides a high potency Vitamin B12 for those needing a high intake. It is taken by being absorbed directly from the mouth (sublingual). Vitamin B12 is essential for healthy red blood cells, energy, nervous system and cognitive function but it cannot be absorbed from food unless the stomach makes ‘intrinsic factor’, which may be reduced as we age or in those with poor digestion. This delicious powder is absorbed directly from the mouth, avoiding the need for ‘intrinsic factor’. A daily multivitamin is also recommended. Vitamin B12 is a member of the vitamin B complex. It contains cobalt, and so is also known as cobalamin. Vitamin B12 is necessary for the healthy synthesis of red blood cells, the maintenance of the nervous system and growth and development in children. Vitamin B12`s primary functions are in the formation of red blood cells and the maintenance of a healthy nervous system. Vitamin B12 is necessary for the rapid synthesis of DNA during cell division. This is especially important in tissues where cells are dividing rapidly, particularly the bone marrow tissues responsible for red blood cell formation. Vitamin B12 is also important in maintaining the nervous system. Nerves are surrounded by an insulating fatty sheath comprised of a complex protein called myelin. Vitamin B12 plays a vital role in the metabolism of fatty acids essential for the maintenance of myelin. Bulking agent: potato maltodextrin; bulking agent: brown rice flour; vitamin C (as ascorbic acid), sweetener: xylitol; anti-caking agent: silicon dioxide; beetroot powder (carrier: potato maltodextrin; acidity regulator: citric acid); berry flavouring (carrier: potato maltodextrin, emulsifier: acacia gum), vitamin B12 (as cyanocobalamin), apple powder, cranberry powder. Take 1 level measure every other day under the tongue, with or between meals, or as your health professional advises. Contains xylitol: do not feed to dogs. If consumed, seek veterinary advice. 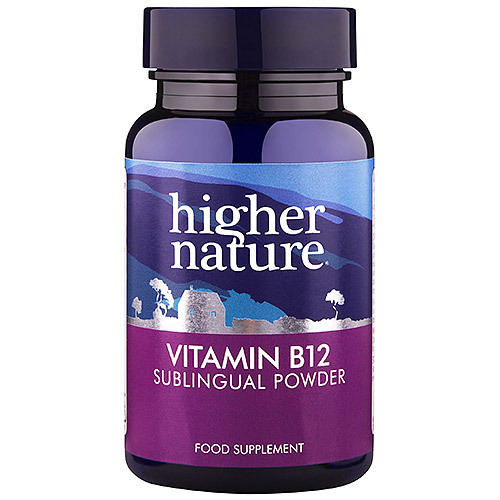 Below are reviews of High Potency Vitamin B12 - Sublingual Powder - 30g by bodykind customers. If you have tried this product we'd love to hear what you think so please leave a review. This supplement provides a high potency Vitamin B12 for those needing a high intake. Vitamin B12 is essential for healthy red blood cells and for energy.